During this year’s Gamescom, we have seen publishers showcasing plenty of triple A titles as well as independent titles offering some unique gameplay experiences. And then, there was a title which isn’t exactly a triple AAA title, but neither a full indie title, Comcept and Armature Studio’s ReCore, launching in a few weeks on PC and Xbox One. The game risks of flying off the radar of most gamers, due to the lack of marketing so far, but it would be a shame if it flops, as it has everything that makes an action-adventure title great. Last week, I had the pleasure of attending a ReCore presentation where producer Keiji Inafune himself, alongside other members of the team, talked about the game, and some of the ideas that make ReCore such an interesting title. Comcept and Armature strived to create a title that’s unique and recognizable at the same time, opting for an anime style that’s not over the top, combining a classic style with a more modern style. The combination works incredibly nicely, as it’s a joy to witness the game in motion. ReCore’s premise may not be exactly original, with main character and Colonist Joule Adams waking up from cryogenic sleep only to find that the Corebot in charge of making the Far Eden colony habitable didn’t complete its job properly, but it sets the tone nicely for the whole adventure, giving it a sci-fi feels that suits the game quite well. 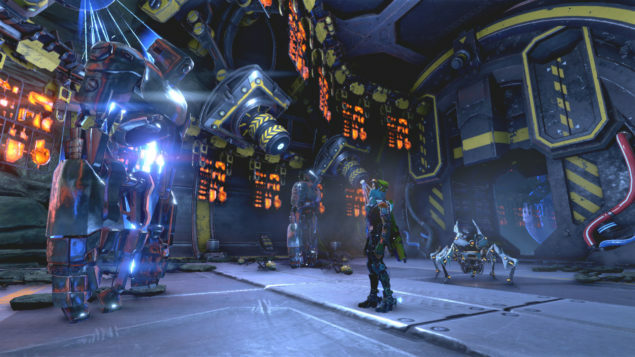 It suits the whole gameplay experience even better, as most of the unique features of ReCore are based upon this sci-fi universe, such as the already mentioned Corebots and the technology that powers them. At its core, ReCore is a third person action adventure reminiscent of the Metroid series, the Metroid Prime subseries in particular, with features that have been clearly lifted from the Mega Man games. Players will take control of Joule as she explores the planet alongside her trusty Corebot companion, Mack, and a few others that will join her during the course of the game. The Corebots mechanics are definitely among the most interesting features of the game, and the ones that give ReCore the Metroidvania feel the team was striving for. Each Corebot is made up of a Core, which determines its personality and a frame, which is completely customizable. Each core determines which special ability the Corebot can use in battle in combination with the frame, so players have a lot of customization possibilities. There are also a lot of Corebots frame parts defined as “exotic”, of which we have seen a few during the presentation, and apparently, there is a story reason for their inclusion so it seems like everything we will experience in ReCore has a good reason to be there. With Corebots coming with different abilities, players will have to choose carefully which two to bring along, as some locations can only be accessed with the help of specific abilities, in true Metroidvania fashion. In addition to Corebots customization, players will also be doing plenty of weapons’ customization as well as crafting by collecting blueprints and parts, so there will be a strong RPG component in ReCore that will offer a slightly deeper experience than expected. While the game features plenty of third person shooting action, there’s also a strategic aspect to ReCore’s combat that definitely make it more interesting. During the game, players will meet enemies that sport different colors, requiring the right ammunition type with the same color to be defeated. This feature, coupled to the lack of a cover system, will force players to always be on their toes, evade enemy attacks and use the right type of weapon. It may seem a little over-complicated on paper, but it’s feels quite natural, after a few minutes of adjustment. 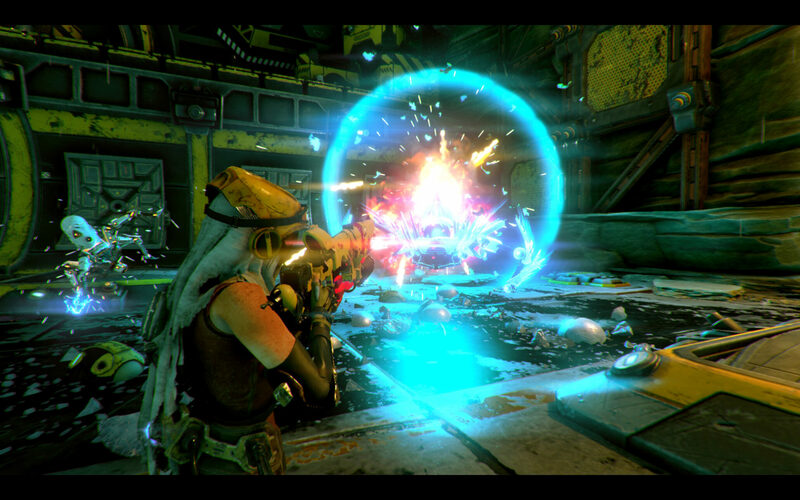 Combat is made even more interesting by a unique type of rewards system, which is tied to the RPG mechanics of ReCore. Once an enemy is close to defeat, players have the choice of pulling their cores in what feels like a fishing mini-game, or just destroy the enemy to gather parts that can be used for crafting. What’s truly surprising about ReCore is how everything flows together and how none of the mechanics feel extraneous to the experience nor the universe. Following the presentation, I had the chance to play the game for a few minutes, and I couldn’t help but notice how smooth the whole experience is, and how easy it is to get used to it in just a few minutes. With plenty of side content, a huge map to explore, and around 18 hours of play time just for the story related content, ReCore has all the elements to become one of the best action adventure games of the year, if the experience manages to stay as fresh and exciting as it is for around 30 minutes. We have nominated ReCore as our best surprise of Gamescom 2016, and that was for a very good reason: don’t let the Mighty No.9 failure sour your opinion of the game, this time Comcept seems to have gotten everything right. They did receive quite a bit of help from Armature, that’s for sure, but Inafune’s enthusiasm when talking about the game speaks volumes about ReCore’s quality. The game will be out on September 13th for Windows 10 PC and Xbox One, with full support for cross-save.